Greetings and Merry Meet Myrddin, I love the post and your view point on how you precieve and recongnize Deity and the Divine. how wonderful, As a Witch my self and a member of the Wica. i do agree with what you have said here. From my Training and Tradition. we do have the universal All, in General refered too as you said Dryghten. or also called Baphomet. and several others that are or atleast secret names within Tradition. like wise i do have my own set of Deity name's from Family as well those i have come to find in relation to my practice. but those Deity i work with Within Tradition we keep secret as known only once one has become a 3rd degree as they are only for those whom have saught the mysteries in full. but there are many other names used as most tend to known of Aradia and Cernnonos to which is fine for those whom use these names. as long as one understands and really builds a relationship with them. Within Tradition i use my elemental god's of the Four winds and Castles of the elemental way's as well to those whom are the Beloved dead and ancestors like wise Lesser god's and Familial too. we also have our personal/patron but they are tend to be for personal use usually. I also agree that no there are no popes or kings/queens. as we do have those are high regard and Witch Queens are only a title for those high priestesses that have atleast 3 other covens in full that have come from her own line. and never a King of the Witches. despite some grandiose claims. Flax,Flagg,Fodder Obere. Yes i do agree, Cuchulain, Also there is another wonderful simple expression and Devotion of FFFF(FFF) of Flax,Flagg,Fodder/ (and Frigg.) An Anglo-Saxon Blessing many attribute to Robert Cochrane, to which was learned by Doreen Valiente after joining his Principle coven, (royal windsor cuveen/ clan of tubal cain) after leaving GBG's Bricket Wood. Also the wonderful Merry Meet, Merry Part, Merry Meet Again, to which most shorten to Merry Meet. The actual text is the passage of the Five fold kiss, Written By Gerald Gardner. not by Silver Ravenwolf who enjoy's profaning ritual's and written rites. A Pagan Ritual Prayer Book, Anyone Familiar With It? i would suggest Ray Bucklands complete book of witchcraft, Ed fitch's a grimoire of shadows/ and magical rites of the crystal well, and also a book of pagan rituals by herman slater but really by ed fitch. Despite what many people may or may not believe, what you find in books and so forth is just information, no matter who wrote it. Even Ray Buckland, Stewart/Janet Farrar. or any other Witch, they have never published the full BOS, as it is not able to. there are aspects that cannot be written. nearly half of all of the actual "meat" of Traditional Witchcraft is experiance driven and Ecstatic, the really important factor's are only done via word of mouth and transmitted orally only even within the more Folkloric and country Witchcraft. Or atleast in my experiances . As i was taught and trained originally and as i my self teach/train my students and initiates is that everyone equally is called Witch, once you wish to be initiated and brought within the circle as a priest you are called of the wica. some call them selfs warlocks and there is president in doing so at least in Scotland and else where. what ever you wish to call your self you may and defend your right as loud and proud as one wishes. the god's care not what you call your self as long as you devote your self to them and commune with and give unto your self to them listen, talk to, learn from, and really devote to your god's. As to the Book Of shadows, the old cunning folk and pre-20th/21st century witches had no books or so really. yeah they might have had journals and recipe books maybe incantations put within them but from all accounts most of the real old world witchery didnt have anything resembling a Book of Shadows really. My Book of Shadows is really just the bare basic and the Core aspects of Wica, as put down by Gerald Gardner. in other journals i have added on rites/rituals and so forth but nothing in added to my core book. and all other material is dated signed and sourced. as well my herbal book and recipes and other bits and pieces that are known to have worked/work. A wonderful Spring Equinox, the wonderful stand still and tipping point from the darkness to the light. a Great time to start a new and move towards the warmth and prepare of course for the coming of Summer. the great youthful goddess and the great crone in equalness in celebration. till Beltane. flax,Flag,fodder,Frigg. As a male witch, i can say, i have only ever called my self a Witch. now within a more country style practice. one can be called a Wizard or a wise one/cunning man. We have no sacred texts as we are a faith that doesnt need them. Also the Book Of Shadows are a ritualized text as well most of the important parts are oral trasmitions. alot of the old world cunning folk would use the Grimoirs and high magic books for those who could read/write. most initiates atleast in any british line of the wica, know that wicca does not have the origin in the mists of time. 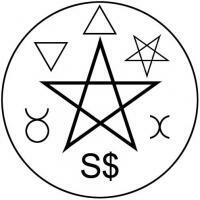 there are certain rites and rituals that were used as well charms and spells used and in our book of rituals that had been passed on by the new forest coven, that did not cross the pond. like you said yes more authentic traditional witchcraft IE the cunning folk were solitary, as they were and are the traditional white witches. What olde Gerald did was take this as well the Folklore and the hereditary practice of a few members of the New forest and blend together with the Ceremonial magic methodology that he knew and worked with into a workable system. like wise i personally enjoy to blend the folkloric practice brought over by my forefathers from the blessed isles and as well blended with the natives here. that i my self blended with the wica. im glad what ever system works for you and any one else. as it really matters not what name we give it as in the end we all should atleast be praising the great one's above. FFFF. Greetings Gwen, As a British Initiate, the whole neolithic thing we all know was/is false, for the rede and karma and such, the only part to that which is important is, do what thou will as long as harm none, then again it is also subjective and something ive never used i know of it but its not in my practice. as such i believe in morals and virtues that are ofcourse tangable and real, dealing with life in the here and now. Yes Gardner did find a coven, as is proven, by philip heselton. like wise people within the witch cult knew of and had confirmed many things not put into published records via edith woodford grimes the maiden and eventual high priestess of the new forest coven, While i am glad to hear that you have gone more to a roots sort of speak in working the cult, i would hope that you do not degruge the wica, as such were all still on a pathway working towards a similar goal, were going about in possible different ways but still in a same manner. i do like what you said, about the Gods, i my self know my god's and they are seperate i cannot understand that fashion of thinking of them as constructs or what have you they have there own personalities and so much more. i do hope you enjoy your practice and keep the faith, may the olde Gods watch over and protect thee, Merry meet,Merry Part,Merry Meet Again, Flax,flagg,fodder,Frigg. Rev,jared High Priest/Magus/Magister Madtown Cuveen Cosmic Grove, Madtown pagan way. How many here have a job outside of there religious/Ministerial work? how do you balance this and how does your job handle if the need arises for you to leave or take time off for some Ministerial call? Traditonal British Witchcraft calander, Candlemas,, February Eve(Brigit-day) Feb 1-2 May Day,, Beltane April 30- may 1st August eve, Lammas August 1 Hallow'een, November eve,samhain October 31st- November 1st --------------------------------------------------------------------------------------------------- Vernal Equinox Generally on march 21 Summer Solstice june 21-23 Autumnal Equinox september 21-23 Winter Solstice December 21-23 ____________________________________________________________ Beyond these Celestial and Solar Feasts and Celebrations there are also 13 Full moon and 13 Dark/new Moon rituals that take place too. for the time using the art magical. Ive Always enjoyed the Equinox's as they are some of the most powerful times of the year, a great Solar/Astronomical and Axis time, Even more so with Equinox the balance With The Great Goddess and Horned God in even keel at this time of the year, till the shift of power the tipping of the scale to the God and his reign for the rest of the year till Beltane and the return of the Goddess.